Addis Ababa (HAN) January 30, 2019. Regional Security. By Sibylla Chipaziwa . Some say drinking coffee originated in Ethiopia, where coffee ceremonies are common after meals. Beans are roasted just before being ground, boiled in a jebena (clay coffee pot), and served in small cups called si’ni. So, it makes sense that Selamawit Wieland-Tesfaye, or Mimi to regular patrons, the owner of Ethiopian restaurant Lalibela Mount Kisco, would open Mimi’s Coffee House next door to her Mount Kisco eatery. Her grandmother grew coffee trees in her backyard in Ethiopia, with Wieland-Tesfaye washing and roasting beans from a young age. She honed her skills working in an Armonk coffee shop while at school. She even wanted to take over the shop, but was not able to buy it. 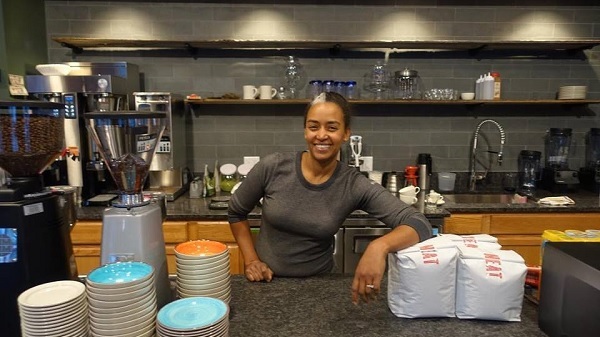 Feeling intimidated by the Starbucks that were popping up throughout Westchester County, southern New York, she decided to open the county’s sole Ethiopian restaurantinstead. At Lalibela, Wieland-Tesfaye would hear diners talking about how bored they were with chain coffee, noting that Mount Kisco didn’t have any independently owned coffee shops. A space had sat vacant next to the restaurant for more than two years, and in May, Wieland-Tesfaye took the plunge and signed a lease, with Mimi’s opening roughly eight months later. The décor features wood alongside industrial elements like exposed wiring, a bright accent wall, Ethiopian masks and sculptures, and plenty of natural light coming in. Mimi’s sources its beans from NEAT Coffee, a roasting company in Connecticut. NEAT owner Kyle Bellinger also runs Osito Coffee, an importer, which works directly with farmers in Colombia and Ethiopia. Right now the coffee shop is using a blend that’s 75% Colombian and 25% Ethiopian from a cooperative in the African country, and single-origin beans from a farm in Ethiopia.